The Elemental Brawl Tournament brings back the loved/dreaded preset teams. With a preset team, if helps even the playing field as no one can gain an advantage via specific cards or combos. However, it does dramatically cut down on creativity and also results in more “luck” when trying to min-max your score as skyfalls/bad boards will play a massive role in determining how well you place. With this post, I will try my best to help give my readers a slight competitive edge based on my own experience running the dungeon. Everyone will be using the same team (max skill and max awoken) and it is important to understand how your leader skill functions along with any combo synergy you may have. The only thing that matters in this tournament is your damage output so I will only be highlighting their relevant awakenings along with their total attack value. Based on the above table, it becomes apparent that water is your strongest attribute followed by dark and then wood. Thus, most of your damage will come from water orb combos that are ideally formed in a TPA fashion as Awoken I&I has the highest base attack dual awakenings. Dark Kali with a TPA may be able to mow down some floors on her own if water orbs are not present and you are able to hit 16x. Do note that the entire team only possesses 2 time extend awakenings. This means that you will only have 5 seconds to move orbs. 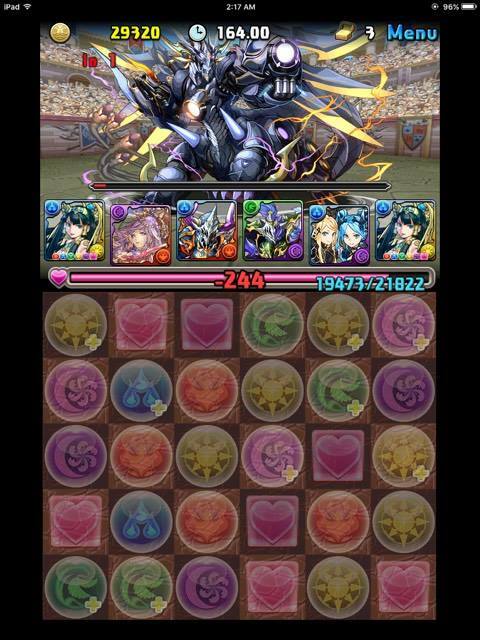 Despite only having 3 skill boosts, you actually start the dungeon with all actives ready. Awoken I&I can be used to help sweep two floors as provides two turns of damage enhancement for both water and dark cards. In an ideal world, you do not use your heart-breakers as they will reduce your max damage down to 16x so only do so if absolutely needed. This also applies to Dark Kali, do not use her unless needed. Due to the preset team and the relatively lackluster actives across the board, there is not too much advice I can offer outside of trying your best to sweep every floor in one go. Using an active skill will drain your time as you have to go through the animation. Furthermore, Dark Kali will produce a random board that will cause you to lose additional time due to having to re-plan along with the heartbreakers resulting in a 16x multiplier. However, if not using an active would result in you not sweeping the floor, please use them. Awoken I&I’s two turns of damage enhancement is the most helpful and should be used every attempt. Where you choose to use her will come down to a matter of personal preference; however, two places I suggest are on the third floor to deal with Earth Dragon and Bowmore (floor 3 and 4) as they tend to be troublesome floors and having double damage will improve your consistency. The other place to use I&I is Hanzo on floor 6 which would also allow you to easily deal with him and help manage the the final floor. Both options are viable, but I was using I&I on floor 3 to improve consistency as it allows for a more guaranteed kill on two hard floors instead of one. Using a water TPA will allow you to make less combos to kill a floor and you do not have to go for the full multiplier on every floor. Only use Dark Kali if absolutely needed. Also, remember to turn off the skill confirmation animations through Others -> Options -> Dungeon -> Skills Off to save a couple extra seconds! I do not know if I possess the skill to match fast enough or the magic stones/patience to refill for that perfect run as there is a degree of luck involved when chasing the top 1%. Currently, I am in the top 3% on Fantastic, Mantastic, and MOMtastic so I know I am at least consistent. I will get Pancaaake her top 10% when she gets home. 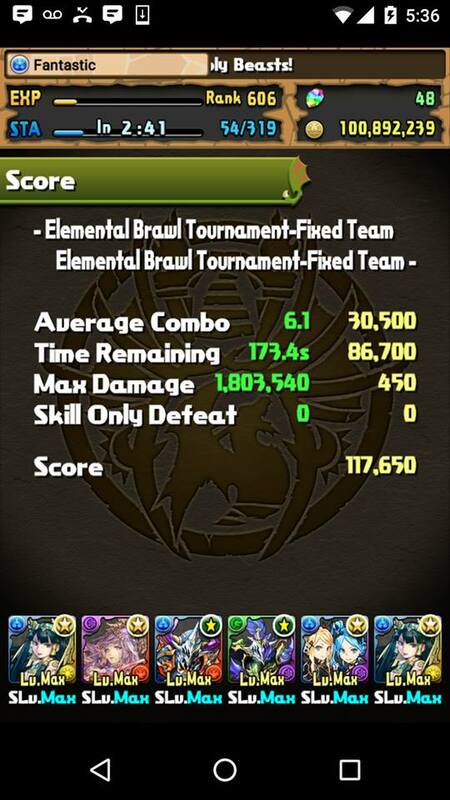 Below is my current best score which is sitting at 1.4% and does have room for improvement as I could have made an extra combo here or there along with being forced to use several actives including Dark Kali which all slow down my time/lower my score as I am only 1,170 away from 1% which is equivalent to 2.2 seconds. Hopefully this overview will help shed some light on how to better approach this ranking dungeon. Many players are thrilled to have a preset team, but it does cut down on the creativity along with forcing players to use a playstyle that is possibly foreign to them. Lack of time extends is crazy, I’m so spoiled these days! Using your guide, I managed 117,920 in maybe ten tries. I didn’t think about the dark and water tpas, or using I&I on an earlier floor, it definitely helped a lot. 2 things: wouldn’t it be more efficient to use the green Cu on the floor becuase you would one shot the monster without much effort or high damage output, if no heart orbs or green orbs on board either use dark kali or do your strategy of getting a high water/dark damage. Using actives is always bad if chasing top top score. Cu can work as well, but usually the prongs do as well. Landed at 19.5% my first run and I’ve got no interest in trying to improve it. I already hate Rainbow teams. An absolute garbage Rainbow team like this makes me “nope” right the heck out. Was very lucky to get 5.3% on my 5th or 6th try considering I lost a few times due on floor 4. Won’t even bother trying to get into the top 1% as it looks insanely hard. Since was able to accomplish my goal below 10%. Well I am glad you were able to achieve the top 10%! I think I’ve been following you since the first ranking dungeon? I can’t recall. Your guides help me do decently, although not as good as you haha. I’m currently sitting at 108,674 and couldn’t be happier. Oh noes =( Should have played a bit more!